How Hard is It to Change a Belief? How Do You Change a Belief? Don't Avoid the JWs, or You May Lose a Christian! As I wrote yesterday, Christians are called to evangelize, and to be faithful in that calling the Christian must engage in the medium of ideas. We must, as the Apostle Paul wrote, "destroy arguments and every lofty opinion raised against the knowledge of God" (2 Cor. 10:5). These arguments and opinions that non-believers offer are based upon their beliefs of how the world works. In order to destroy their arguments, we must ultimately change their beliefs, but this is much more easily said than done. Just how does one go about changing a belief, anyway? Realize that a belief is an idea a person takes to be true. In other words, if someone holds to the belief that Jesus was created by the Father, then that person thinks the statement "Jesus is a created being" is true. No person can be said to believe something that he consciously acknowledges is not true. If he knows it isn't true, then he doesn't believe it, even if he may continue to act as though the belief is true. The contradiction is between his belief and his action, not between the truth value he holds and the belief itself. There are only two ways that I can think of to change a belief. You can either provide new information that the person hasn't yet considered, or you can show how their current beliefs are contradictory and therefore cannot both be true. Because beliefs reflect the truth value of a proposition, one cannot simply decide to hold different beliefs, to change statements from false to true. Beliefs don't work that way. I've demonstrated this many times when I've spoken to groups in the past. I've asked "How many of you believe that there is a pink elephant in the parking lot across the street from this building right now?" Consistently, my audience responds incredulously. I then modify my question. "How many of you would believe that there is a pink elephant in the parking lot across the street if I offered you a million dollars to believe it?" Of course, a few hands go up, but then I ask, "Do you really believe that's true or are you just assenting to the proposition to get the money, even though you don't believe it?" Everyone agrees that they are just acting out the agreement, but they don't really think there is a pink elephant in their vicinity. The first way to change a belief is to provide new information to a person, or perhaps highlight information that they may know but have neglected to consider. 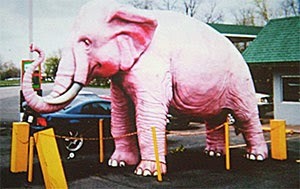 Going back to my pink elephant example, I usually ask my audience, "Would your beliefs change if I told you that driving in today I saw a fleet of Ringling Bros. trucks also parked across the street?" They will nod in agreement that the new fact helps open them to the possibility of an elephant nearby. I follow with something like "What if I also told you that albino elephants will appear pink when wet; would that increase your ability to believe the statement?" Now, they have two new facts and the ability for them to believe the statement is increased. I can then continue to build my argument, but I've eliminated some of their resistance to the idea already. You can clearly see that additional information helps people believe things they may not have held before. The second way one can change a belief is to demonstrate that the person's current belief isn't valid. Let's use "Jesus is a created being" as an example. Whenever I talk with Jehovah's Witnesses about the nature of Jesus, they always tell me they believe that the Bible is true and the Bible teaches that Jesus is a created being. I then ask, "What if I can show you where the Bible explicitly denies this idea? Would you still believe it?" Usually the reply is, "Well, it doesn't." But as I press, they usually relent, mostly because they think I will be quoting from John 1:1 or something like that. I preface my remarks by asking if they agree that everything we know can be categorized into two compartments, that is placed in one of only two "buckets" if you will: there are things that began to exist and there are things that never began to exist. Everything you can think of falls into one of those two categories. There simply is no third choice. To this I've had no one disagree. I then take them to the book of John, chapter one verse three. (I skip John 1:1 altogether). In the NWT the verse reads, "All things came into existence through him, and apart from him not even one thing came into existence." I ask, "Is the 'him' in verse three referring to Jesus?" to which they answer "Yes." I then explain, "Here, in John, it says that every single thing that came into existence, it came into existence through Jesus. Jesus made every single thing that had a beginning. The NWT explicitly says, "apart from Jesus not even one thing came into existence." If that's true, then Jesus must exist before the very first thing that began to exist. Jesus put everything into the "came into existence" bucket. But that means that Jesus must be in that other bucket. Jesus must have existed eternally. He cannot be a created being because John 1:3 doesn't allow that option." You can see the problem the Witnesses have here. If they hold to their belief that Jesus is a created being, then their own Bible, the thing that informs them about who Jesus is, is wrong. If they want to hold that the Bible is true, then they have to give up their belief that Jesus is created. They know they cannot believe a contradiction, but they don't know what to do at this point. Tomorrow I will end my short series on beliefs by talking about how these techniques play out in the real world. In short, there is no magic bullet that is going to make someone believe But realize that these tools are necessary when we are engaging others in the battle of ideas. Let's not go into battle unarmed.